Finally a worldwide GLOCK license for Airsoft! Umarex gets the worldwide License! Hot from the press, UMAREX to obtain the worldwide Glock License for Airsoft! At noon we received the final word in a joint press release from UMAREX and Glock. No April fools jokes, this is real. UMAREX has per immediate effect the worldwide Glock license. UMAREX will be making officially licensed Glock pistols in 4.5mm/.177 airgun and 6mm Airsoft. Expect them in stores around November 2017 already. Check the official press release below. How they will integrate with the local Cybergun deal in France is not yet known. We requested more info from UMAREX. We have writen so many stories regarding the Glock license (check the related articles), glad this finally happened. UPDATE: During AirsoftCon (Okt 14th) you can get a first glance at the production Airsoft Glock pistol! UPDATE 2: The trailer movie clearly states "Not intended for sale in France, including Frence territories outside of Europe". 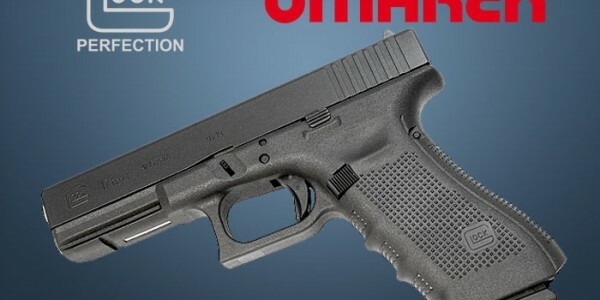 UPDATE 3: Umarex will focus on most popular Glock models from the 17, 18 and 19 series. The pistol will be available in 4 different price ranges. From low-end springers to high-end full option pistols. Founded in 1963, GLOCK has been setting the global standard for handguns with polymer frames for decades. UMAREX and GLOCK are two world market leaders meeting on equal terms, the best prerequisites for a successful partnership. UMAREX will in the future build the famous GLOCK pistols in the categories "Airguns" (4.5 mm / .177) and "Airsoft" (6 mm). 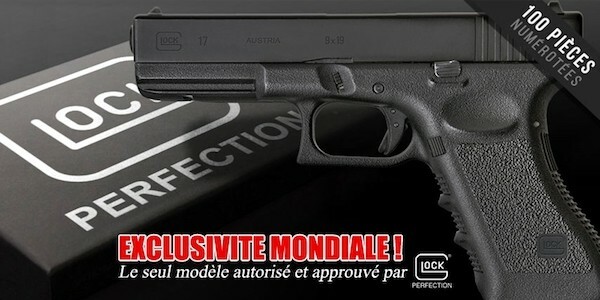 GLOCK replicas will be distributed worldwide through sporting goods dealers, except in France and French territories. The worldwide distribution is expected to begin in November 2017. Particularly attractive for collectors, the license allows the replicas to carry the original markings and be marketed in authentic packaging. We had a nice chat with Bill Thomas during IWA 2017 and talked about Airsoft in The Netherlands and our website beeing online for 15 years already. We concluded with a nice interview in their OKT 2017 issue. This issue is now available! Download their app or get your hard copy at selected dealers. Our interview concludes with 3 pages of all things airsoft in The Netherlands. 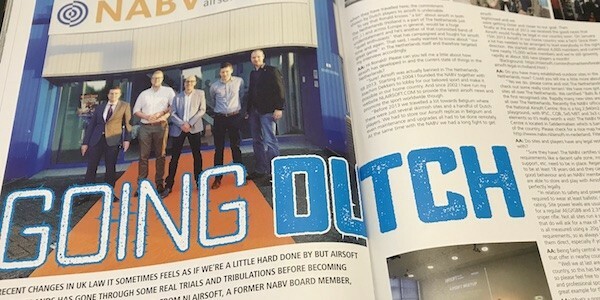 The current status of Airsoft here in The Netherlands, European opportunities, Dutch skirm sites, The National Arisoft Centre etc. Check this Oktober issue for a good Airsoft read! 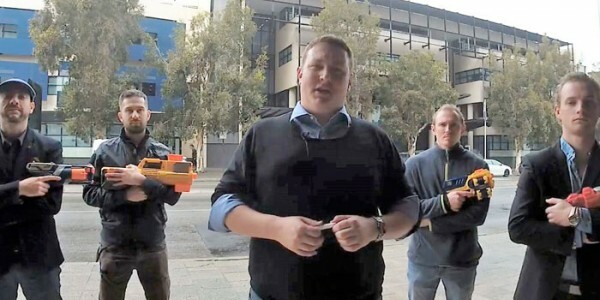 Video released by the Liberal Democrats in Western Australia show Aaron Stonehouse, MLC launch a campaign to legalise airsoft in Western Australia. This is probably the strongest campaign to have airsoft legalised in Australia after many years of efforts by airsoft organisations in Australia to have their sport recognised. Australia has very strict gun laws. Watch the dedicated Facebook Page of the Western Australia Airsoft Club about the campaign to legalise airsoft in Western Australia! Give them a like and show them some love from the rest of the Worldwide Airsoft Community... Good luck Aaron, Mark & Laurentiu! Their next step is a face-to-face meeting with the Minister for Police by the end of August. They got full support from the European Airsoft Association (EAA) and UKAPU. The Airsoft Glock 17 pistol is reality! There is a small problem though, this Inokatsu Glock 17 Gas Blowback Pistol will only be available in France, so lucky are those airsoft players who are residents in France. However I am sure it will spread to the rest of Europe, including The Netherlands very fast. The Glock 17 pistol is licensed under the Inokatsu brand. Cybergun acquired the Taiwanese airsoft manufacturer Inokatsu in 2010 with a plan to provide premium airsoft products and Inokatsu is an established name for premium airsoft guns. That means the pricing for the Inokatsu Glock 17 GBB Pistol will command a premium price! Initially, Cybergun will be releasing a Limited Edition Inokatsu Glock 17 GBB Pistol with a price of €350 and it will just be limited to only 100 pieces. The photos included here are what airsoft players can expect to receive if they get the limited edition which will come with a Glock t-shirt, case, Glock Cap, and a Glock Patch apart from the pistol and magazine. It is on pre-order as we speak. Also mentioned on their facebook page, a regular Inokatsu Glock 17 Gas Blowback Pistol with a price of €250 will also be released and orders will be taken by the 28th of August. Regarding pricing, it is in the Inokatsu range… Which will make airsoft players, even in France, to hesitate as it is expensive though we expect that Cybergun may not find it difficult to sell as there airsoft players wanting to own a fully licensed airsoft Glock. The question is if it will perform better or as well as the Marui G17 Gas Blowback Pistol or even the WE Airsoft G17 GBB Pistol. It would have been great if it is Glock 17 Gen 4. Unfortunately, this seems to be a Gen 3 version. After all those years the Glock airsoft pistol is real and out there soon! Will you buy this unique item at the price point Cybergun is asking for? Let us know in the comments! Laylax did a nice Vector AEG introduction again, they first released new Vector AEG rails. 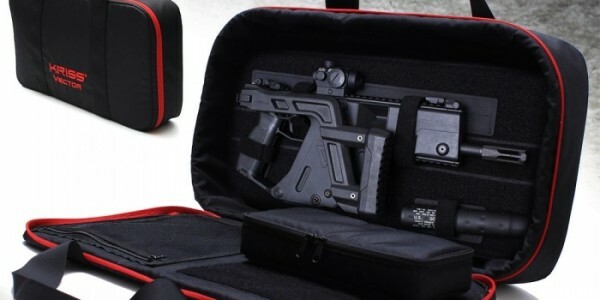 Now they have a gun case for the Krytac KRISS Vector AEG in stock! Embroidered on the front is "KRISS VECTOR" and inside there are magazine pouches and utility pocket. This was specially designed for the unique shape and weight of the KRISS Vector AEG whilst at the same time gives a sophisticated luxury feel.